Travel. Backpacking. Both have changed an incredible amount in the last two decades. My first solo trip was 18 years ago now. Early February 1999 and I headed out on my first round the world adventure stopping in Thailand as my first stop. Khao San Road was far more basic compared to today. No fast food chains on the road, I feel like backpackers were generally a little older back then, and clearly there weren’t as many. Fast forward to 2017 and Khao San Road is still a party street. It’s way cleaner – I remember seeing rats in the restaurants back in 1999 and I suspect you wouldn’t today, it’s more packed I’d say with the party stretching around blocks. And yet, I hate to say, it didn’t seem nearly as friendly. But it’s got me thinking – how has the way I travel changed in that time? 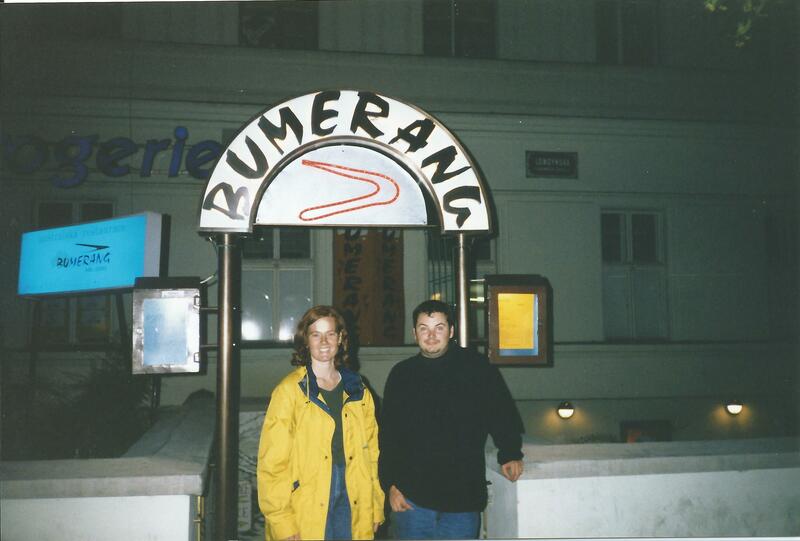 An interestingly named bar two Aussies decided not to go in, Prague, 1999. THEN – Well, I checked the internet fairly sparingly. Mostly I just checked my email. I was probably online once a week and I would have to hunt down an internet café most of the time. I would check the occasional newspaper website too and also the football scores from Australia, but that was about it. I hadn’t even heard of facebook, Twitter, or the idea of social networking! As I started blogging in 2006, I still had to hunt out internet cafes and deal with very slow upload speeds when I had photos to upload. THEN (1999) – Everything was booked through my travel agent before I left, or not booked at all. Making a phone call seemed problematic at best in 1999, so for hotels and (mostly) hostels it was always a case of turn up and hope for the best. In fact, seven months of travel equated to not one single night of accommodation booked. I often turned up in a place with zero idea of where I was going to stay that night. 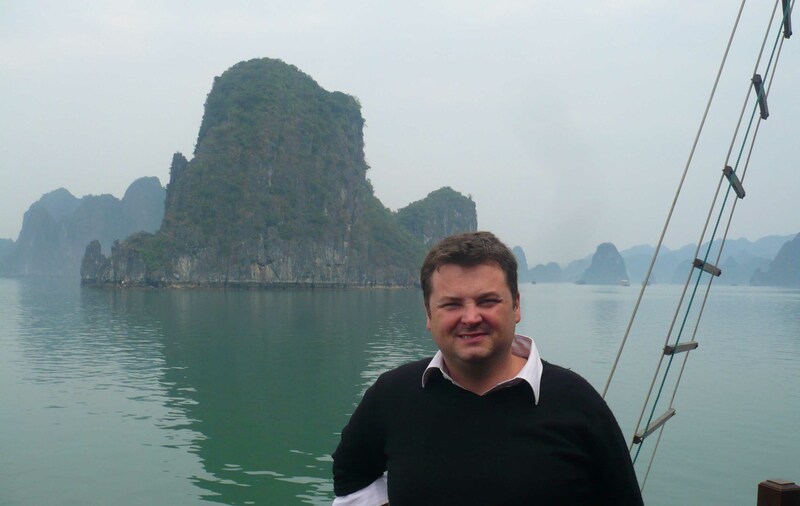 NOW (2016-17) – The internet allows me to book my accommodation in advance. Airbnb, hotels dot com and all the other hotel websites, the website of the actual hotel itself (the preferable option) – there are countless ways to book your accommodation. And indeed airfares too, if the trip is not too complicated I will not visit a travel agent in the planning process. Last year’s trip to South America I did, but it was two months and I wanted to put everything on the table to work out what I could do. I booked most flights, my tour to Galapagos and a couple of nights accommodation in Quito so that I could be in the same hotel as I would be for the Galapagos tour. Oh, and travel insurance. But all of that could be booked online. 2 months I was away, and most nights were prebooked accommodation with a combination of hotels and Air Bnb stays. There were a couple of instances of turning up to find a bed, and I arranged my Salar de Uyuni tour upon arriving in Uyuni. THEN (1999) – you’d think flying hasn’t changed THAT much in 20 years, but it has. Back in 1999 I was all about the round the world ticket that got me the best possible value, and I did. On a $3200 round the world ticket I went to 26 countries or something like that. There were over 20 flights in total. Movies were always shown on a big screen at the front of the cabin. Flights were rarely full except for Los Angeles to Melbourne which was packed. I really enjoyed all the flights, it was exciting. NOW (2016) – Lines at airports are sooooo long. Everything seems to move at a snail’s pace. Security is much higher of course, and they have a little list of things that you can’t bring on the plane. Today, I get a little nervous flying. A little bump here and, if I am in the wrong frame of mind, and I start to (needlessly) stress. 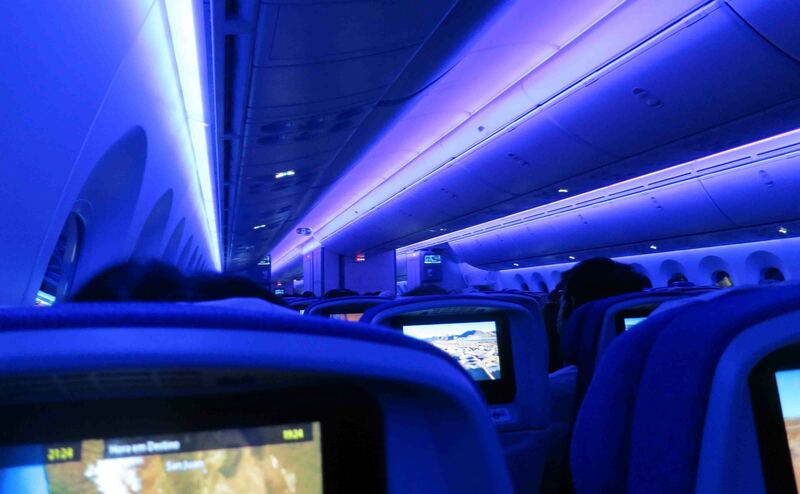 Still the entertainment systems are well cool and planes are like made in phenomenal sizes these days. Airport taxes and various surcharges are huge these day, there was only like $500 tax on the 1999 itinerary. Points don’t get you as far but they are easier to accrue via shopping and credit cards (yet by flying again you just don’t get what you’re used. THEN (1999) – I just had to keep the costs down. In Europe that meant dorm beds in hostels and the like. It meant drunk dudes getting back into the room at all times of the night. It meant hot rooms on hot nights. It meant cheap places in Asia where you got a bed and a fan and a door. Standards weren’t as high as they are now in 1999 either. I was younger and more laid back. I think. I mean, I’ve always been highly strung. But still, I slept a lot better at 24 years old than I do now at 41. It was great to meet people this way and find people to hang out with and go out with at night. Well. Today I like my own room. Unless I’m sharing with my wife or someone (else J) I know. In fact, I really don’t care to spend a night in a dorm again. Yes. This has made life more expensive. I am far less concerned with the cost than I am with the comfort these days. I mean, in 2001 I spent three nights in a house in Goa for $2.50 a NIGHT. It was that cheap cos I shared with a stranger I met on the bus. Otherwise it would have been $5. Actually that wouldn’t bother me so much today. But I have no desire to spend a night in a room full of 12 strangers snoring and coming and going. Oh and I snore too so I have no desire to put people through that either! Air Bnb is a welcome addition to the accommodation options out there. 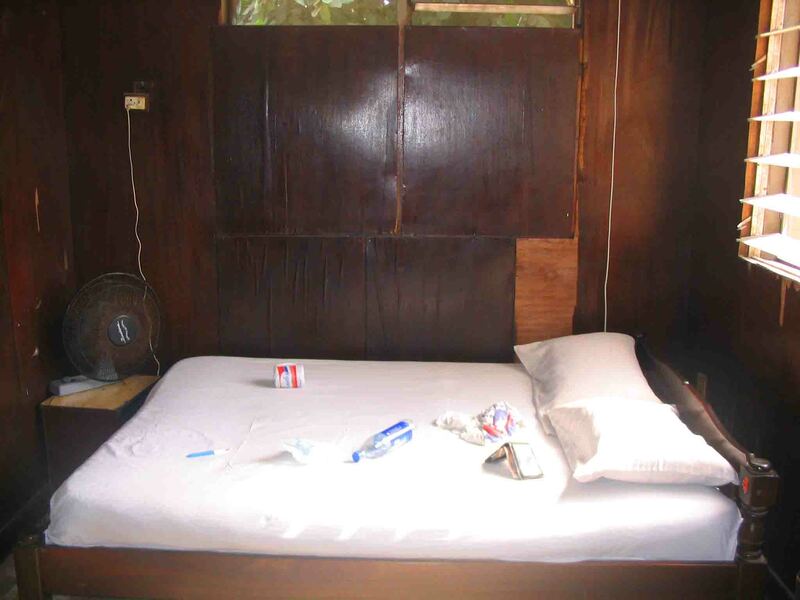 I had a few inexpensive nights in a private room in an apartment in South America. And these days most hostels aren’t that cheap anyways. Actually I like most things about hostels still to this day, just not the sleeping arrangements! So ones with private rooms remain on the radar, although seriously some are more expensive than hotels. But the access to a good kitchen, local deals, tours and the like is still valuable to me. THEN (1999) Well. It was mostly cash and traveller’s cheques. And I used ATMS in Europe. I very rarely used the credit card. And I filled it with a certain amount of money. NOW (2016-17) Now I use the credit card more freely. The main game-changer on that score is internet banking. Now I can actually keep track of what’s going in and out of the cards, I have more control. 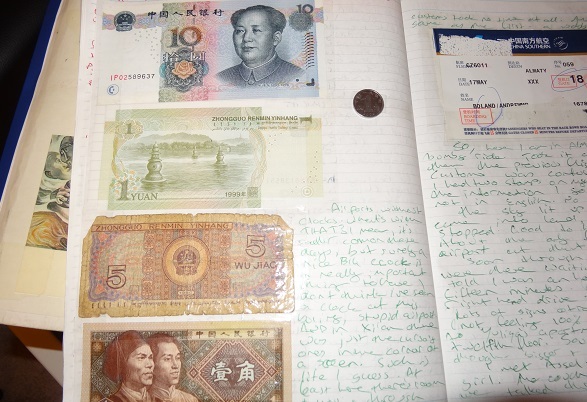 Traveller’s Cheques – well I took a few for my trip in 2011, and they proved useless in Africa where I tried to use them. I’d used them a lot in West Africa in 2006 and although I had to find the right bank, they were handy. In 2011 in a different West African country, the best I could find was like 40% commission. I could use them in Europe which I did but honestly, not worth it nowadays. Cash will always be useful of course, and when you change it at home you know exactly what rate you got. THEN (1999) The ultimate in frugality was I back then. I went to India with a budget of $20 AUD a day, and I kept to it! I followed it all quite religiously. In fact I always recorded what I spent. I had $50 AUD a day for Europe and the US. $20AUD for Egypt, India and Thailand. It wasn’t enough in two of those countries, but I wasn’t that far off either. NOW (2016-17) Today well, in South America I was so far over budget at times that I couldn’t tell you the final balance. Did I spend $1000 more than I budgeted? Probably more. And the budget was more than before and a fair bit of accommodation and other things was already paid for and not included in my day to day. BUT – I don’t say ‘no’ to nearly as many things these days. And the rate prices went up from the writing of the guide book (it was the latest one) to what I experienced was pretty astronomical. Some doubling of prices. Or more! Ahhh so this is when I started it. It started as a very sketchy piece of notes. I wasn’t as diligent as I should have been, days would take maybe half a page. Then there was that time in Iceland where I had to catch up three weeks’ worth of entries and things were short and inaccurate. 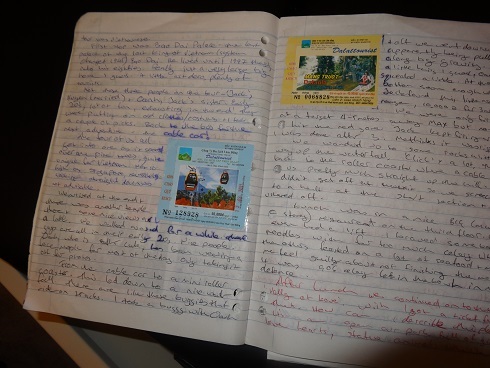 It was in April 1999 when I was enjoying my last few days in India that I saw someone sticking tickets and other things in their diary and I thought that was a great idea. However, when you are three weeks behind it’s not surprising that somethings go missing! NOW (2016 – 17) Even though I blog now, my diaries are very important to me. I frequently write four A4 pages plus on any given day, and I never fall more than a couple of days behind. 3 days behind is cause for massive panic. I look forward to writing, and I make sure I keep up to date so that I don’t lose tickets and the like that I stick in there. I buy postcards mostly now for my diaries although I do still send the occasional one. Unfortunately my diaries for those who don’t know of my trips before 2011 were all destroyed in a flood whilst I was overseas. Very sad indeed. They will always be important to me! And so…. There it is! One of my longest posts for a long time I think! Sorry for all the words! So… how has the way YOU travel changed over the years? Please do comment! Oh, and May the Journey Never End! This was an interesting read. I don’t think I have been travelling long enough to have noticed any significant changes. I started buying plane tickets online right around the time when it was transitioning from travel agents. I’ve only used traveller’s cheques once when I was in high school. That’s so sad that you lost your diaries. thanks for reading Stewie! glad it was interesting! Interesting post! I remember my first couple of overseas trips, my mum recommending traveller’s cheques. They seemed a hassle with having to find somewhere to exchange them and then carrying around largeish amounts of cash, but I can imagine how useful they would have been back in the day. I like the photos of your diaries 🙂 Shame about the flood! yeah its a pity i also lost 8mm film I shot in 2004. very disappointing. Thanks for commenting! Having seen your impressive stack of diaries from the South America trip, I can attest that you are a devoted diary writer! I wish i was as committed! i remember hi5! not very well its a distance memory. not sure i actually used it… i used email around 1996 or 1997 too. i know airline staff dont get the perks they used to! Great post Andy! Very interesting to think of how the internet has changed the game…I remember booking flights from the travel booth at my university “travel center” in 1999…along with a mystery room in some sketchy NYC hostel 🙂 Now it’s hard to imagine booking something without seeing at least a few pics first! thats so true. you never knew exactly what the rooms would be like. although, photos can lie too! thanks for commenting!